Field technical report (FTR) is module which is specially designed for automating the process of creating, submitting, discussing and resolving on-field issues reported by dealers. FTR is specially created for the issues unresolvable by the dealer and Service Managers. Such Issues requires the attention of expert technical professionals. Field Technical Report module also serves as a knowledge base for other Service Managers, Dealers etc. In case the similar issue pops up in the future, the dealers can access the FTR and know the best possible solution. What is the need for Intelli Field Technical Report Module? Every product in its entire lifecycle needs repairs, many times customers come across such issues that solution for which is not available to the dealers and service managers. Such issues need to be reported to the top level executives in the OEM before they turn into a challenge for OEM. Thousands of problems arise on day to day basis and keeping a track of every problem is not so easy. Intelli Field Technical Report Module serves as a central repository for all the issues reported by the dealers along with their solutions. 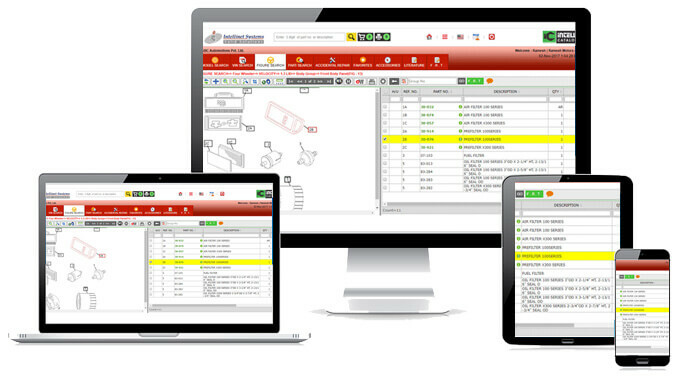 Intelli Field Technical Report serves as a database which helps Dealers and Service Managers to review the solutions in future. 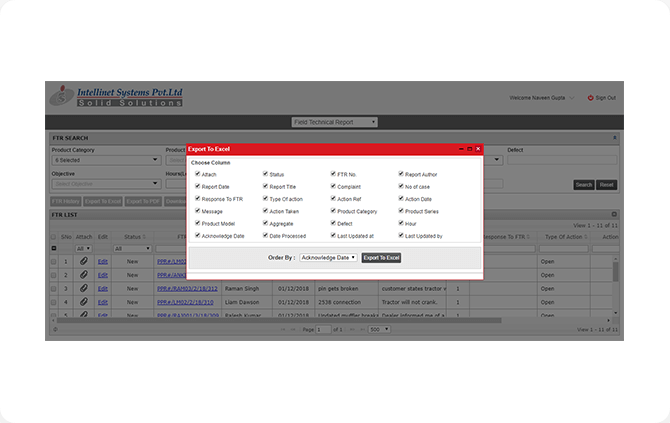 In addition, it also helps to keep a track on the status of each and every report which is just next to impossible with manual tracking. There are multiple search options available in FTR module. 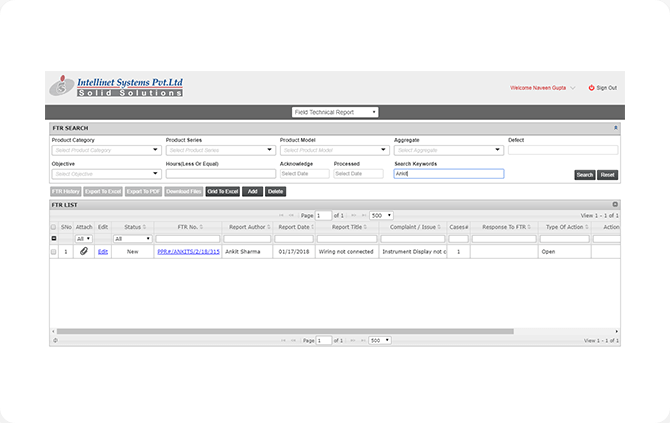 User can easily search a particular FTR by undertaking a combination search. Varieties of other search parameters are available to help the user find the right FTR within no time. this report showcases the details of the FTR created along with the status of the report, solution status and other related information. 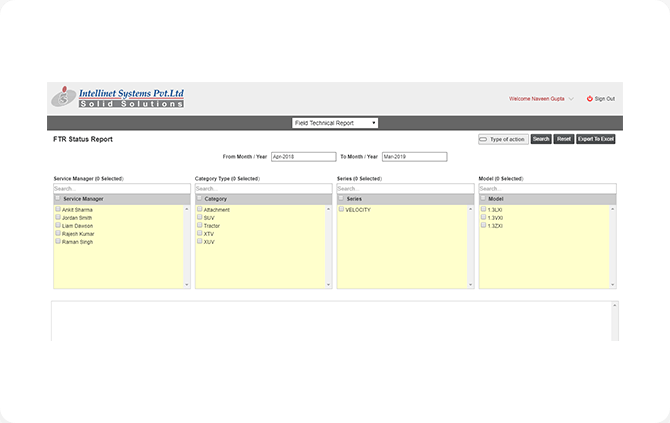 User can refine the search for the particular FTR by selecting the category, model, series etc. 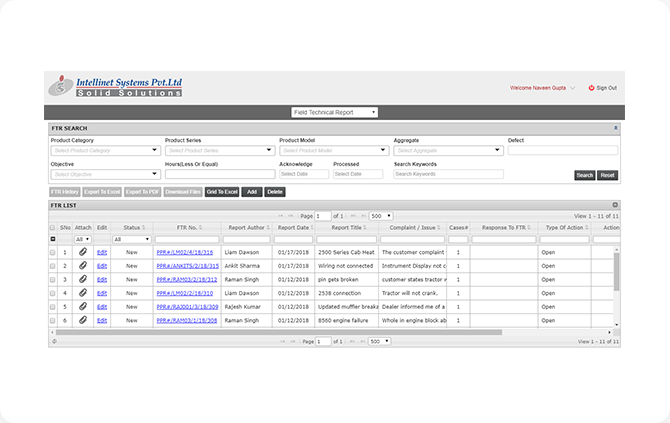 In addition, user can also see the status of the reports belonging to a particular time period. Like FTR submit report, it can also be exported via excel. this report showcases the age of different reports in days at different levels. Like the above two reports, this report can also be exported via excel sheet for future reference. This report showcases the number of FTR created by the Service Manager or against different model and series in a particular span of time. User just needs to select the month, year and the category from the drop-down list. The users of the report can easily download the report via excel for analysis and reference. 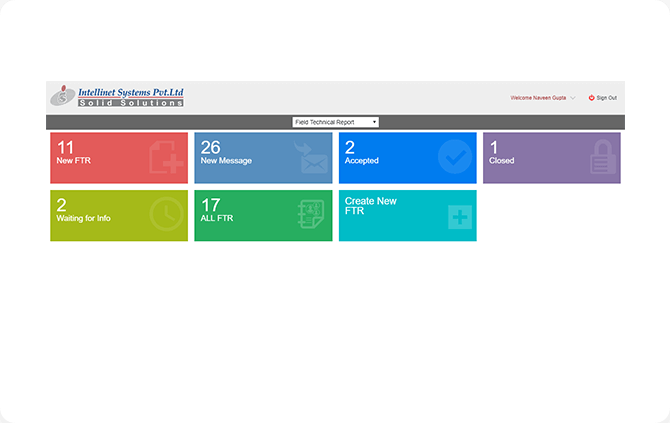 The dashboard of the module is quite interactive with KPI (key performance indicator). User can get to know the number of FTR pending, new FTR created, FTR accepted, FTR waiting for info and a lot more. Automated process minimizes the chances of error. Track of each and every report generated by the service manager and dealer. Database for other dealers to solve the related problem before raising the issue.